Able to charge via a charger for a smartphone, PC USB port and a portable battery for a cell phone, no need of a dedicated battery adapter. Optional charging cradle available. Able to communicate & output using Bluetooth 4.0 (Bluetooth Low Energy) technology. Simple, no pin required auto pairing with Bluetooth 4.0 for iOS devices. Equipped with Bluetooth Smart Ready which supports Bluetooth 3.0 / 4.0 (BLE). BLE communication for iOS devices and Bluetooth 3.0 high speed communication for other OSs. Bluetooth 4.0 allows users to communicate with iOS devices (iPhone, iPad) without MFi certification. 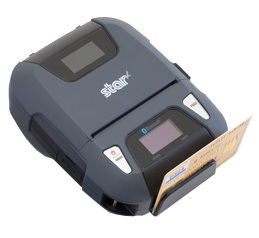 Easy to determine printer status and error type. 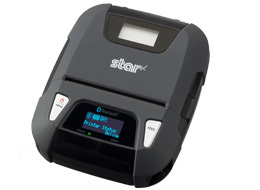 Supports the Star Line mode commands (StarPRNT) for portable printers. Able to read magnetic stripes in accordance with ISO or JIS standards, making it possible to create convenient solutions for tablets or smart phones that don't support reading magnetic stripes. Supports advanced encryption of card data (DUKPT, AES, 3DES). StarIO facilitates developers in easily designing mobile applications without complicated communication control on diverse operating systems like iOS (iPhone, iPad, iPod) and Android. AllReceipts, the free digital receipt service, supported. Apple, the Apple logo, iPad, iPhone, iPod, iPod touch, iTunes, Retina, Mac, Mac OS and OS X are trademarks of Apple Inc., registered in the U.S. and other countries. The trademark “iPhone” is used with a license from Aiphone K.K. The Bluetooth® word mark and logos are owned by the Bluetooth SIG, Inc. and any use of such marks by Star Micronics Co., Ltd. is under license. ※Please contact the seller about Linerless Paper. (Note) Battery operation time may shorten depending on environment temperature, operation conditions and battery charge frequency.